The Cardiac Rehabilitation team is located across two sites, University Hospital and the Centre for Exercise and Health, Watch Close, Coventry. The Team is made up of Cardiac Rehabilitation Nurses, Exercise Specialists, Dietitian and Clincal Psychologist. The Main programme is run from the Centre for Exercise and Health, however we are happy to plan a home programme for you. We also offer education sessions and Dietitian and Psychology appointments. You will automatically be referred to our rehabilitation programme and be seen by one of our cardiac rehabilitation nurses during your stay in Hospital. Your initial consultation will provide you with all the necessary information that will help you plan your discharge and those early couple of weeks at home. We will also provide you with details of our rehabilitation service and a Heart Health information booklet to take with you on your discharge from hospital.If you are a surgical patient you may receive a home visit. Other patients will be seen in a nurse-led clinic at the Centre for Exercise and Health, where you'll discuss matters related to your diagnosis and treatment. Your rehabilitation will be planned to meet your own personal needs and goals. Approximately 2-4 weeks after your heart attack and 6 weeks after your cardiac surgery you will be invited to attend your physical fitness assessment. Its not as bad as it sounds!! At this appointment you will have the opportunity to meet one of our exercise specialists and a cardiac rehab nurse to discuss your activity goals and also complete a short stationary bike assessment. This appointment is important in helping us plan your rehabilitation and helping you achieve your goals. Following this appointment you can join our 8-10 week exercise programme. You can then attend Mondays and Thursdays or Tuesdays and Fridays. The exercise sessions will be either 12:30pm or 1:30pm. Immediately after each session you are invited to sit in a 10 minute, informal information session held in our cafe area. These sessions will contain useful information relevent to your condition. Once you have completed your hospital based rehabilitation programme you will have the opportunity to join one of our maintenance programme. 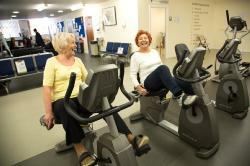 We have sessions available 5 days a week (including evenings) at the Centre for Exercise and Health. There is a small fee to pay for each session or alternatively we have membership packages available. 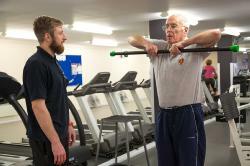 These sessions are run by qualified British Association for Cardiac rehabilitation (BACPR)phase IV instructors. Some of our patients have joined our Heart support group. The group provides ongoing support for patients and organise social activities such as coffee mornings and days out. If you would like more information on the heart support group please contact the cardiac rehabilitation department. You may not wish to continue in the gym and would prefer to exercise indepentanly, if this is you we can offer advice in order to help you maintain your activity. We can also refer you to classes held at Centre AT7, Xcel Centre or Caludon Castle School if this is more convienent. These are external to us but run by qualified instructors.